Arthroscopy is a minimally invasive surgical procedure which allows surgeons to visualize, diagnose and treat many conditions within the body. Initially used as a diagnostic tool in preparation for traditional "open" surgery, arthroscopy has advanced in both instrumentation and surgical techniques to become a proven, viable replacement for traditional, large-incision operations in many cases. 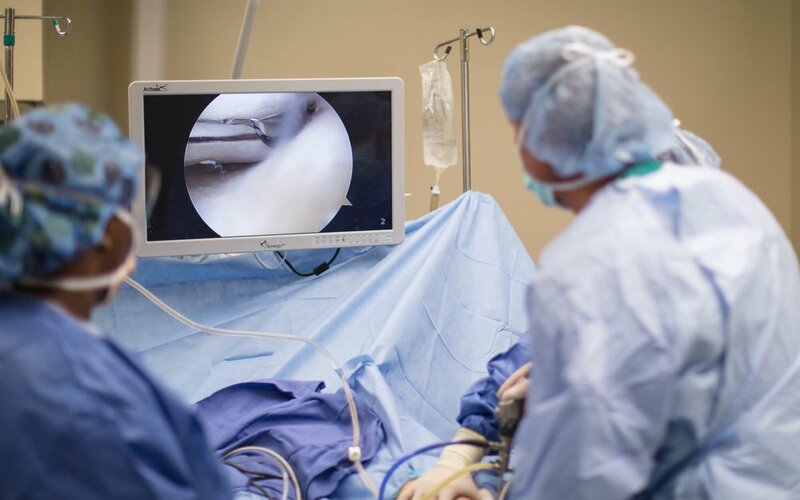 Due to its low physical impact on the patient, arthroscopy allows for faster recovery than open surgical techniques and is normally done on an outpatient basis. The result is that patients are able to begin recovery from the comfort of their own homes the same day and return to normal activities faster. The arthroscopic procedure begins with the surgeon making several small "access" incisions in the skin around the joint, just large enough to insert the medical instruments. An arthroscope, a small video camera, is then inserted so the surgeon can "see" inside the joint. This specialized camera is equipped with a magnification and lighting system that sends the video feed to a monitor in the operating room. With visibility established, other specialized instruments are used depending on the procedure being performed. These instruments are inserted through the additional incisions. When the specific procedure is complete, the instruments are removed and the small incisions are closed with suture. Recovery is much faster then traditional "open" techniques, but varies depending on the patient and the procedure preformed. Learn more about Shoulder Arthroscopy. Learn more about Knee Arthroscopy.